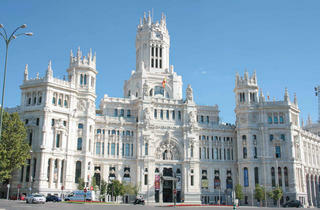 The city's main tourist artery runs from the famous Metrópolis building to the Plaza de España. Shops, bars and even a casino line this wide street that stretches for more than a kilometre. 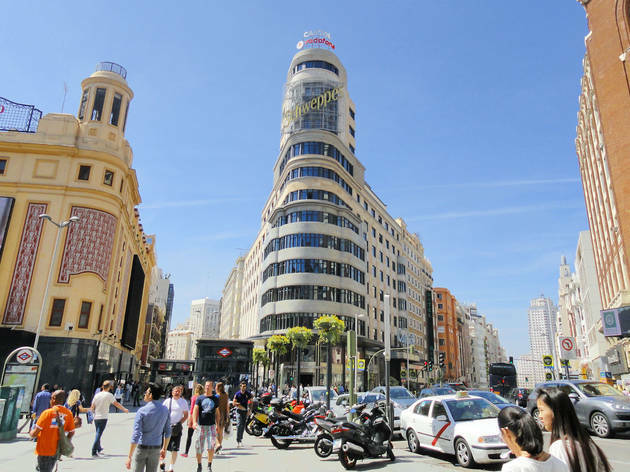 If you start walking at the Metrópolis building, with its stunning dome crowned by a bronze statue, the next landmark you'll come to is at Gran Vía 1, the address for Grassy jewellers since 1952. A bit further on, the Hotel de las Letras deserves a peek inside before you're wowed by the window display at the Loewe shop or stop to have a drink in the legendary Museo Chicote, which, despite its name, isn't a museum at all, though there is some art on the walls in the form of photos of celebrities who have passed through the swinging doors. 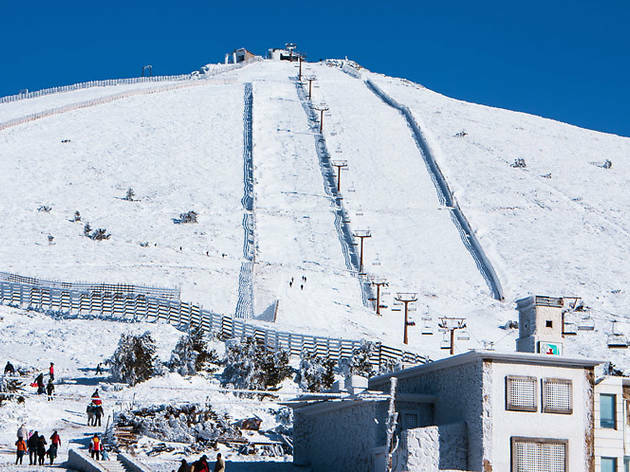 The impressive Telefónica building kicks off the next leg, where clothing shops compete with each other to grab the eye, and the euros, of a wide variety of clientele. Look carefully ­- some of the shops are inside old cinemas that have long had to close their doors. 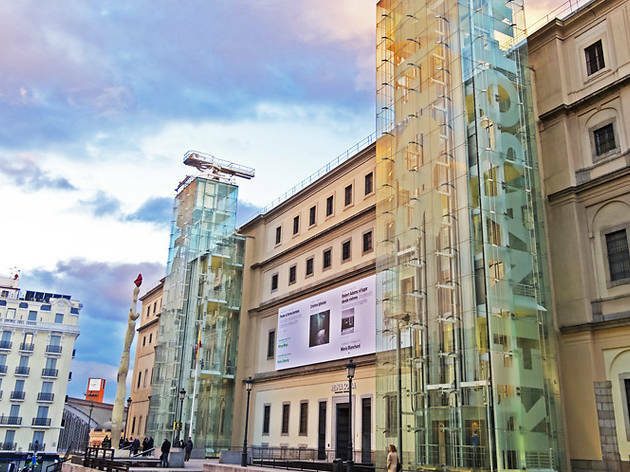 Still showing films on the big screen, however, are the Palacio de la Prensa, Capital and Callao cinemas, in the square that divides this celebrated street. From here to Plaza de España theatres such as the Lope de Vega and the Compac update their programming every season with major works. Gran Vía comes to an end between the Torre de Madrid and the Edificio España, facing the monument to Miguel de Cervantes that's in the centre of the grand square. 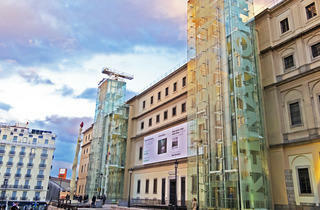 Exploring the area known as Madrid's Art Triangle is compulsory for any visitor to the city. The Museo del Prado, the Reina Sofía and the Thyssen-Bornemisza are the three vertices that make up this traingle that is right on the Paseo del Prado, but they're not the only places where you can see art in the area: Madrid's CaixaForum and its vertical garden are also great places to contemplate beauty. But you don't have to walk the hallowed halls of the grandest museums and galleries to admire the all the art Madrid has to offer. Small galleries like Elena Ochoa's Ivorypress, urban art created at the hand of the likes of Suso33 and collectives such as BoaMistura, along with temporary exhibitions by young painters in bars and restaurants round out Madrid's cultural panorama. 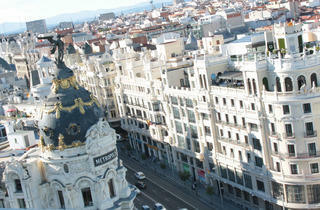 The Madrid skyline is one of the most attractive in Spain. And if there's a perfect place to take it all in, it's from the rooftop terrace at the Círculo de Bellas Artes in C/ Alcalá. From this massive patio you can see the whole city, its great avenues, famous monuments, green spaces, and the Cuatro Torres, the capital's big skyscrapers. It's also an ideal spot to have a drink and watch the sun set. 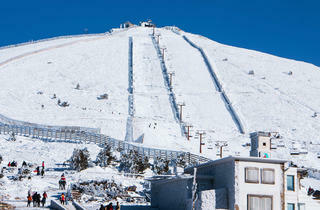 But that's not the only vantage point for enjoying the incredible views. In Gau&Café, smack in the Lavapiés barrio, you can have dinner while you admire ruins from an 18th-century building or the 'corralas' - apartment buildings with a central courtyard and balconies running around each floor that each flat opens onto - very typical of Madrid's residential architecture, especially in this neighbourhood. 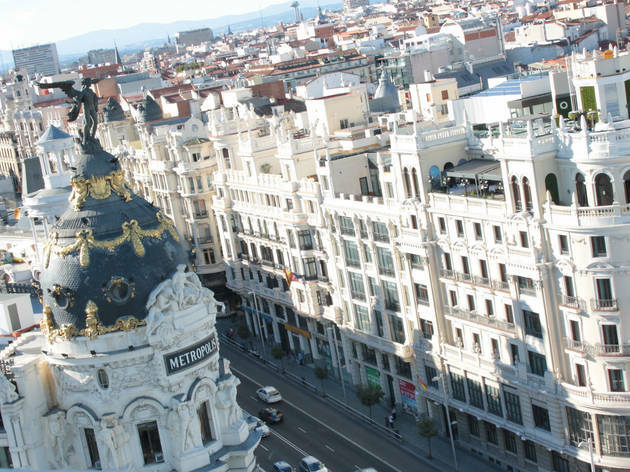 If you're looking for something a bit more central, try the Hotel de las Letras or the Urban (with a swimming pool), which are just a short walk from the Puerta del Sol. The lookout point from the Basílica de San Francisco el Grande or the one behind the Templo de Debod show a lesser-known side of the capital, while if what you're after is more of a bird's-eye view, head for the Teleférico de la Casa de Campo. 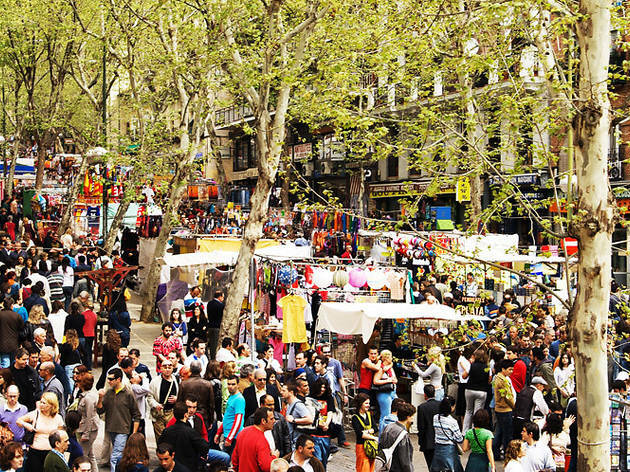 Every Sunday it seems like the whole of Madrid is in one place: C/Ribera de Curtidores, in the Embajadores neighbourhood, where dozens of stalls are set up selling second-hand clothes, vinyl records, jewellery and just about any object you can imagine. 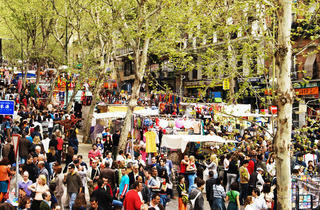 This is El Rastro, the most famous and oldest flea market in town. Get there early in the morning unless you're really into crowds, because later in the day the street turns into a raging river of shoppers trying to elbow their way against the current as the vendors wage a shouting war over who has the best deals. Bar and café owners have taken advantage of the draw El Rastro has and have opened up nearby, so you can always find a place to duck out for break or an energy boost. And don't forget to visit the antiques shops down the side streets. 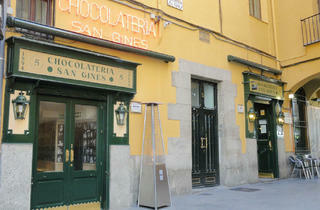 Over a century ago this chocolatier's opened its doors in a hidden alleyway between Puerta del Sol and Plaza de Ópera. Today San Ginés serves up the most famous churros in Madrid, and it's a popular meeting point for clubbers heading home after a serious night out. Surrounded by authentic decor and the classic snapshots of celebs on the walls, you'll wait anxiously for your mug of warm dipping chocolate, churros or porras (just like the tasty fried bread of churros, but even bigger around). Be sure to get a glass of water to wash all that delectable sweetness down. The waiters are constantly running up and down the stairs, inside and out, to satisfy the never-ending cravings of their clientele. 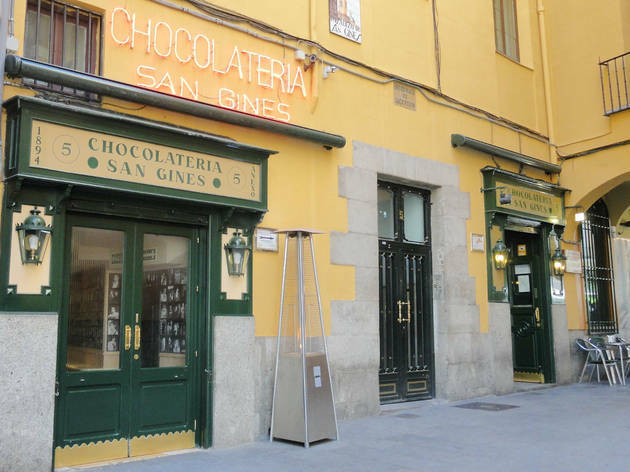 The churros and porras are made by San Ginés, using the same reliable recipe since 1894. The chocolate is also made on the spot and can be mixed with any of the liqueurs they've got to hand for an added jolt. 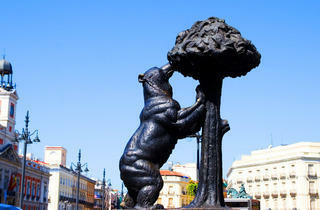 The quintessential symbol of Madrid and the meeting point for lost tourists and friends heading out on the town, 'The Bear and the Strawberry Tree' sculpture, at 4 metres and 20 tonnes of bronze, is not only in the centre of the Puerta del Sol, which is in the heart of Madrid, but is also the starting point (0 km) of all the motorways in Spain. Don't shy away from the typical tourist photo. 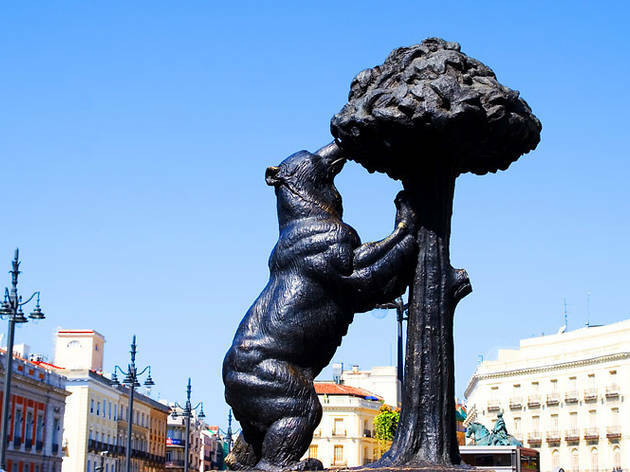 Be sure to wait your turn with the groups of admirers crowding around for their shot of 'El Oso y el Madroño', which also appears in Madrid's coat of arms. For years the statue was in front of C/ del Carmen, but now stands at the mouth of C/Alcalá and the Carrera de San Jerónim. The streets of the Malasaña neighbourhood were the centre of Madrid's post-Franco 'Movida' countercultural movement, and they're still abuzz with nightlife. Bars like El Penta, La Vía Láctea and Tupperware are heaving with party people into the wee hours at weekends. It's worth wandering around the barrio to stumble upon some of the new spots that have opened in recent years. If a night out dancing is more your thing, you're also spoiled for choice. 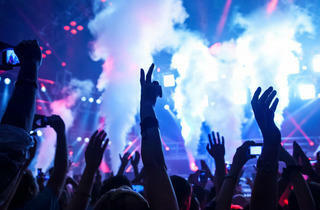 You'll hear a lot of talk about Kapital, pumping out house and dance music - the funkier the better - in its seven floors. To boogie the night away to the top pop hits of the day, head for Shôko. And indie kids won't be disappointed at Independance Club or Ocho y Medio. When you're getting to know a city, it's just as important to try the local cuisine as it is to take in the art and culture. 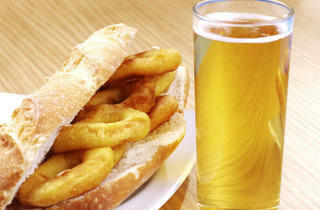 Madrid makes it easy with two essential traditional dishes. 'Cocido' is a stew that is typical of Madrid's fare, and there are a thousand different ways to prepare it. The locals love their 'cocido' so much that there are even tours you can go on to try the best in the province. Some of the best 'cocido' can be found at Lhardy, with one of the oldest recipes in Madrid; La Bola, where it's not unusual for them to serve a hundred a day; and Malacatín, a traditional Madrid tavern in La Latina. 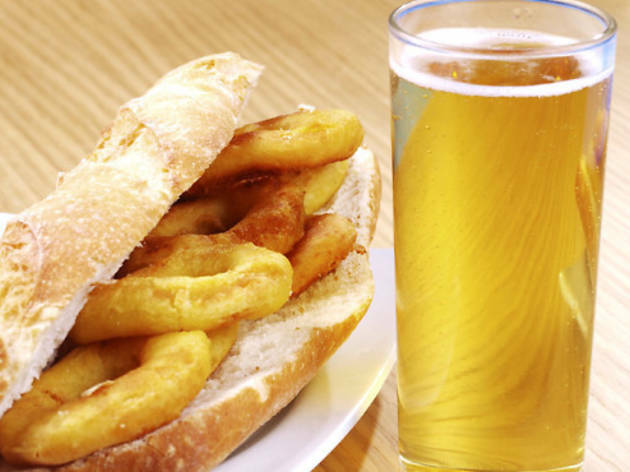 For the best calamari sandwich, take a seat at El Brillante café, opposite Atocha station. Be sure to ask for it with or without lemon or mayonnaise, to suit your taste. And the streets around Plaza Mayor are laden with home-grown café bars like Postas and Ideal, where you'll always find these sandwiches filled with tender breaded calamari on the menu. 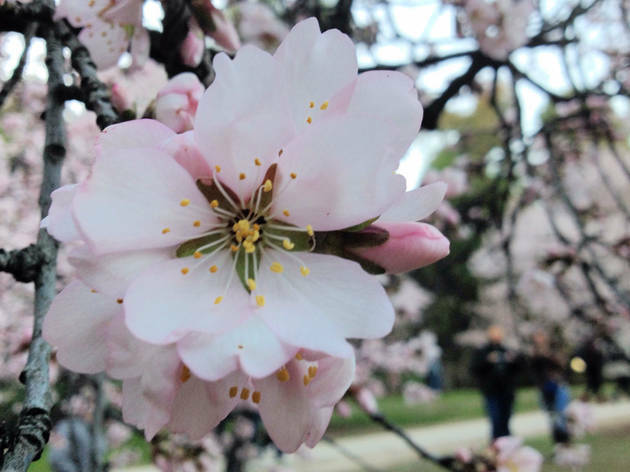 There's a park in Madrid that even a lot of the locals don't know about where the almond trees bloom each spring. The Quinta de Los Molinos, in the El Salvador barrio, boasts 21.5 hectares that make a lovely home for a large number of tree species, including olive, pine and eucalyptus, plus several fountains and a lake. 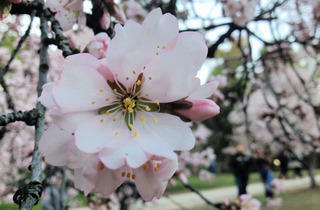 But the real stars are the pink and white flowers of the almond trees, which also give off a heady scent. This garden was owned by the Count of Torre Arias, but in 1920 became part of the estate of César Cort Botí, an engineer and architect. Since 1997 it has been considered a Historical Park, and at weekends it welcomes families kicking a ball around, couples taking a romantic stroll and groups of friends who can't stop snapping shots of the colourful trees with their mobile phones. 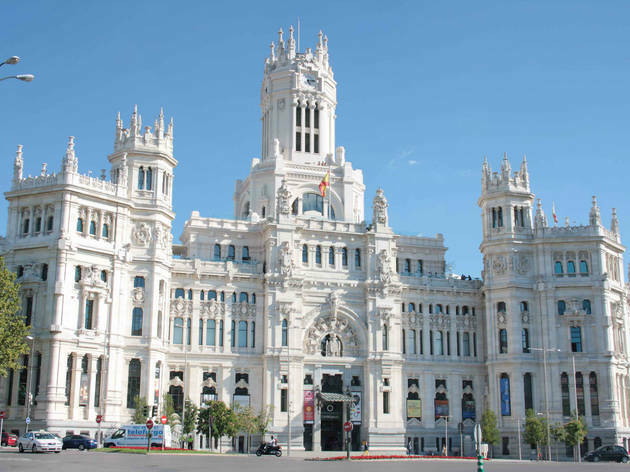 If you can stand the heat, Madrid's summer festival season is the best time to see the capital in all its splendour. 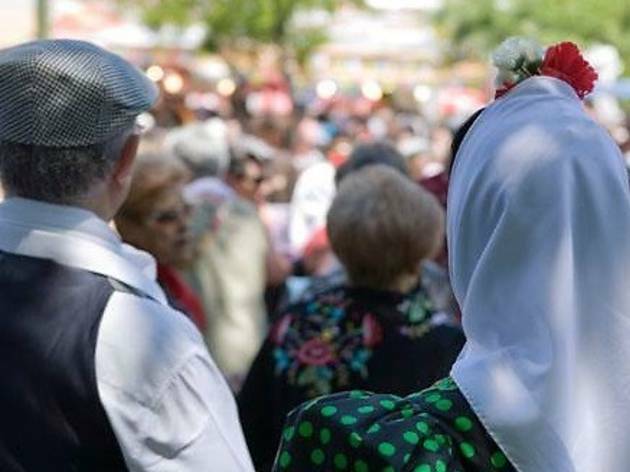 Spring has its share of celebrations, with Dos de Mayo, marking the 1808 uprising against French occupation; and the San Isidro festival honouring the patron saint of Madrid with outdoor concerts, street stalls selling food and drink, and spending the day in the park named after the saint. 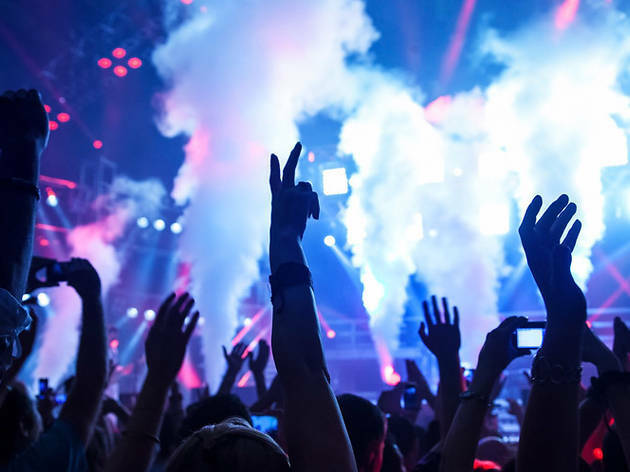 Once those are history, the parties really pick up, with the streets filled with festivals and merry-makers virtually every weekend throughout summer. The big one in mid-July is the Virgen del Carmen, which is a big deal in the barrios of Puente de Vallecas, Chamberí and Villaverde Alto. 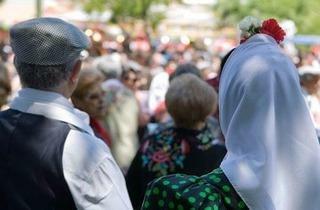 And August celebrates the Verbena de la Paloma in La Latina, honouring the neighbourhood's very own patron saint. 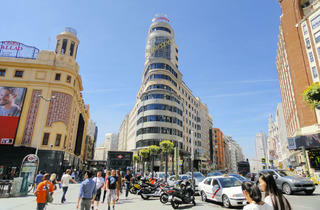 Visit Time Out Madrid for more ways to make the most of Madrid.